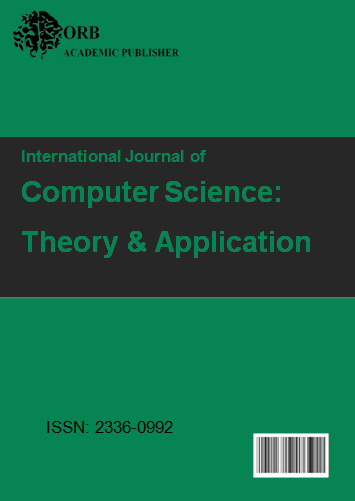 Already have a Username/Password for International Journal of Computer Science: Theory and Application? The manuscript should be well written, clearly presented. It is recommended that you ask colleagues to read over your paper prior to submission to ensure it is of a high standard and conforms to a high level of scientific writing. Accepted manuscripts cannot be published unless the copyright form is completed, signed, and returned by email to editorial@orb-academic.org. Authors may download this form by clicking HERE. All manuscripts must be submitted via this online submission system. Using this system, authors can submit by uploading all manuscript files directly to our plate-forme and check the status of their manuscripts during the review process. Reviewers can access the manuscripts and submit their opinions. Editors can manage the whole submission/review/revise/publish process. Publishers can see manuscripts that are awaiting publication. Registration and login are required to submit items online and check the status of current submissions. Select Register from the menu, Register. Complete the form carefully. In the field "Register as", select the author role. You can also select the Reader role. Log in with this journal => User Home => "Edit My Profile"
Select "Author" for the field "Register as"
When you are logged in, in the User Home, click the “Author Center” link. Under the text “Start here to submit a manuscript to this journal,” click the "Step one of the five-step submission process" link and follow the process of submission. When you finish the submission process, you will receive an acknowledge confirmation e-mail. If you do not receive any confirmation e-mail upon manuscript submission, Contact Us. Ethical standards for publication allow guaranteeing a good quality of publication. Once submitting a manuscript to ORB Academic Publisher, each author explicitly confirms that the manuscript is in conformity with ethical standards of publication. So, it is critical to avoid some specific ethical violations such as: Plagiarism, Simultaneous Submission, Data Fabrication and Falsification, Duplicate publication, Improper Author Contribution. The submission file is MS-Word or PDF file. The final version must be a package containing: PDF version, the source file (Latex or MS-Word file) and the figure files. I confirm that the submitted works represent our contributions and have not been copied or plagiarized in whole or in part from other works without clearly citing.